Do you guys follow my talented, hilarious Bright Night sister, and totally down to earth friend Amazon_Ashley on Instagram? She's seriously one of my favorite people, and she's been going through an entire Whole30 lifestyle journey that is SO awesome to follow along with. Do you want to know the best part of following her - besides the amazing recipe ideas, cookbook printables and pretty pictures? She MESSES UP and CHEATS! Like... she's a REAL person, who has three little, adorable, messy kiddos, a husband who works a lot, and issues with her weight and eating that she's learning to conquer, just like most of US! Alright, so the purpose behind this post ISN'T to announce that I'm jumping on the hard-core Whole30 bandwagon (and BIG respect for all of you who do it!)... but I DO love and eat a LOT like, and Ashley has some of the best resources for healthy, REAL, affordable, quick, yummy (and yes, Whole30 and Paleo diet approved) recipes that I've ever seen! 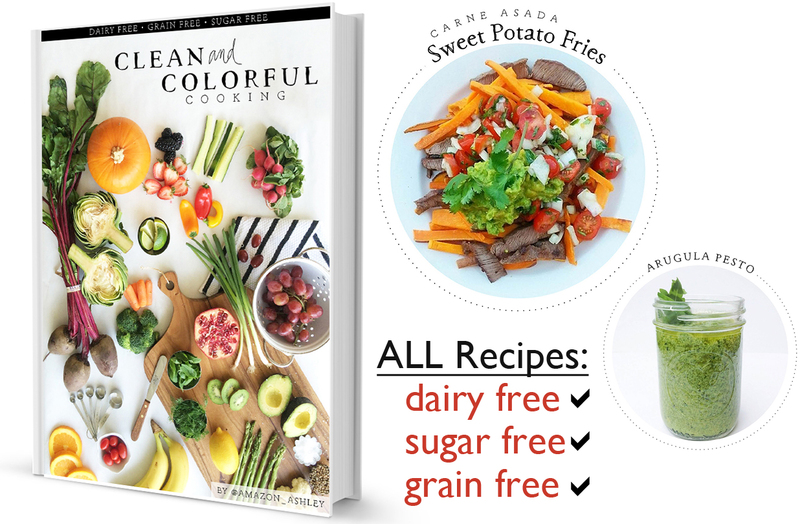 If you follow us at @houseofsmiths on Instagram then you might have seen that I posted about Ashley's first Clean & Colorful downloadable cookbook a few months ago, but for those of you who didn't get a chance to buy it then, you're in luck, because it's over half off now on groopdealz. YEOW! 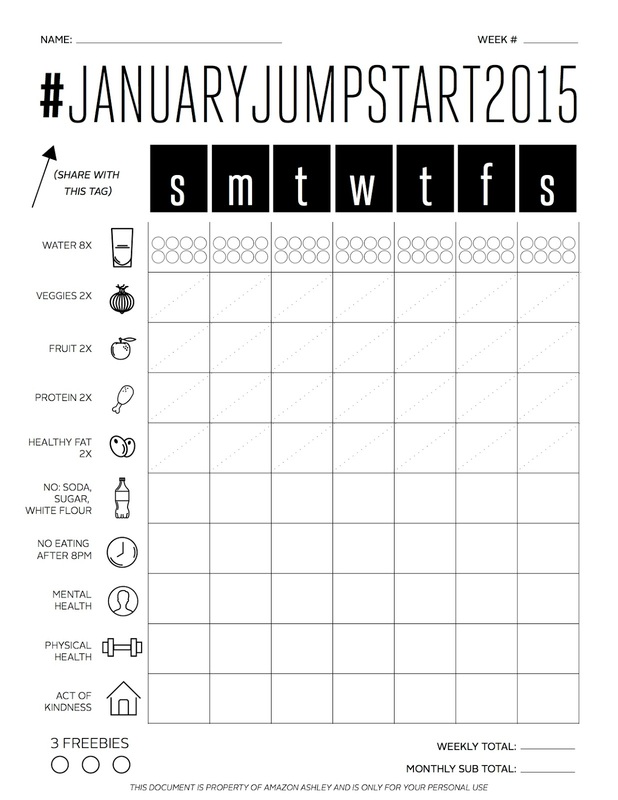 She's also got this free downloadable #JanuaryJumpstart2015 printable that's genius! I LOVE everything it includes, and I totally printed out like 15 of these and gave them to everyone at the office a few days ago. haha! What are your tips and tricks for staying on track when eating right, setting a goal or just trying to stay on track with a healthy lifestyle? Personally, I love the idea of actually marking off something. It's strangely satisfying. ha! Awesome, I was just thinking I needed to follow someone on instagram that I can get healthy ideas from! Thanks!! So nice to catch up with your blog again. I lost all my bookmarks...and stumbled back across it and enjoy your honest and witty view of life, cool projects and the lipstick post is just what I needed! Love yourself, you are amazing and weight is a weird thing. Now over 50, I'm still trying to strike the right balance between enjoying food/life and practicing restraint/active/life and about to launch into the desert/dry stage of restraint. All good. Praying for your husband's back recovery and appreciate your frank posts, you know it has helped so many sufferers and caregivers! I love Ashley! 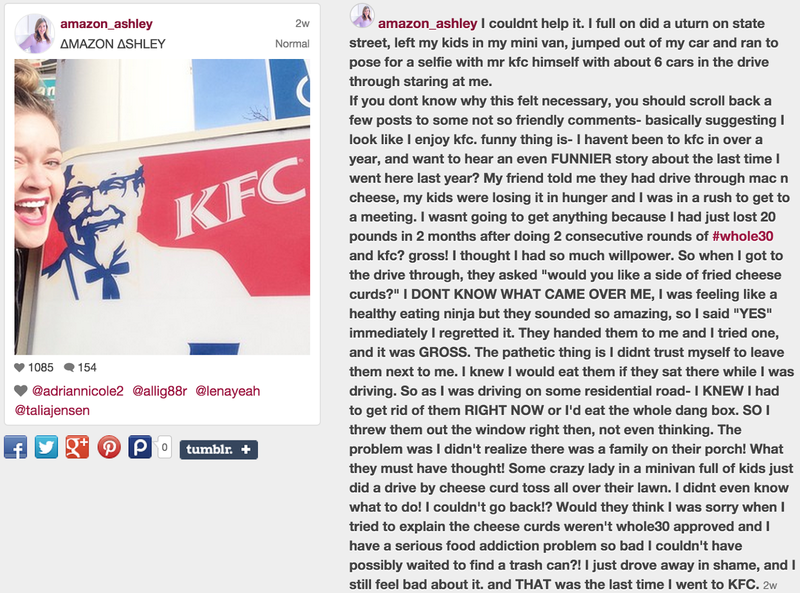 Thanks for sharing her KFC adventure - ha! I like the idea of keeping track of my day by marking my water, veggies, etc. It's especially helpful when you're starting out, I think, and it can be a real eye-opener when realizing just how much starch and sugar we eat, and how much fresh produce and water we do NOT! It's much easier for me to stay on track when I prep food ahead of time. Sometimes it's as simple as baking a batch of chicken breast to keep in the fridge, and prepping fruits and veggies for immediate consumption. I always keep water near me, ready to drink, so if I start to feel snacky, I drink water! Also, having it next to you helps prevent the guilty walk to the fridge for a diet coke. That's another trick: If you don't buy the junk food, you won't eat the junk food! If I have a box of Oreos staring at me in the pantry (it's for the kids, right? ), you better believe I'm going to start craving milk's favorite cookie with a tall glass of icey cold milk. Ugh! Eat more. Seriously! We crave sugar and naughty carbs when we're hungry because it's quickly absorbed by our bodies for fast energy. If we're filling our bodies regularly (5-6 smaller meals a day), and drinking enough water to float away (haha!) we'll avoid those pesky snack attacks. Part of my struggle has been figuring out what to eat. I need ideas and simple recipes! Following people on Instagram or online who post healthy meal ideas helps me create a grocery list that can make plenty of meals and snacks that will help me stay on track. Ashley is totally on the ball when she said after completing Whole30 the cheese curds tasted gross. It's amazing how our body adapts, and will eventually crave, a healthier lifestyle! I was totally inspired by your dedication to lose weight, and I know you can do it again! Good luck, girl! Thank you for sharing the printable I love it! I am currently doing a giveaway on my blog and would love if you joined!